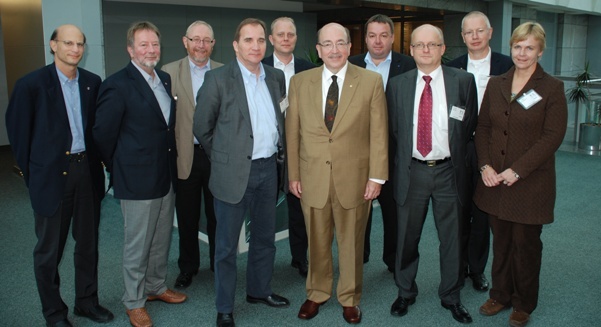 Left to right: Owen Herrnstadt, IAM Director of Trade & Globalization; Arve Bakke, Fellesforbundet President (Norway); Jens Bundvad, Nordic-IN General Secretary (Sweden); Stefan Löfven, IF Metall President (Sweden); Mads Anderson, CO-industri Vice President (Denmark); R. Thomas Buffenbarger, IAM International President; Claus Jensen, CO-industri Vice President (Denmark); Heikki Kauppi, TEK President, (Finland); Jan-Henrik Sandberg, Swedish Paperworkers Union President (Sweden) and Marit Stykkett, NITO President (Norway). Continuing in its efforts to create strong networks with unions from all over the globe, the IAM met this week with the most powerful union leaders from the Nordic industrial unions. During their visit, union presidents from Sweden, Denmark, Norway, and Finland learned more about the current jobs crisis in North America as well as the IAM’s strategy for rebuilding our industrial base. A major part of the strategy, explained IAM President Tom Buffenbarger, is to build strong alliances with our trade union brothers and sisters in the Nordic countries. Citing the IAM’s historic alliance agreement with Sweden’s IF Metall and the newly formed Global Alliance of the World’s aerospace unions, Buffenbarger said that trade unionists must work hard to develop joint programs that will be timely and effective.